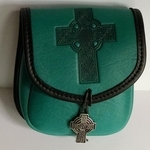 These high quality leather belt pouches are a great gift for yourself or a friend. They are a fantastic addition to any Renaissance Faire Garb, SCA Garb, or even your everyday wardrobe. The Leather Pouches come in four sizes: Small (4.5" W x 5" H), Medium (5.5" W x 6.5" H with a divider inside), Wide (8" W x 6" H with a divider), & Deep (5.5" W x 8.5 H", with divider inside). All of our leather products are made in the USA! They are available in the colors shown, but can also be special-ordered in many other colors. If you don't see exactly what you want, it can be special ordered. Please call us at 973-653-5147 to place a special order.